Hawaii Electric Industries (HE) is the primary electric utility serving over 95% of the state's residents, interestingly they also own the third largest bank in Hawaii, American Savings Bank. Oil is used to generate Hawaii's electricity (already more expensive than natural gas or coal) and given the islands remote location, additional transportation costs lead to resident's electric bills being very expensive, up to 3x more than the average household on the mainland. Environmental and political pressures have led to the ambitious goal of generating 100% of the state's electricity from renewal sources by 2045, with interim goals between now and then. It's admirable goal, however Hawaiian Electric is a small inefficient utility and isn't up to the task both operationally and financially, they need a bigger partner. In December 2014, they announced a merger with NextEra Energy (NEE) with Hawaii Electric shareholders receiving a combination of NEE shares, cash, and most appealing to me shares in Hawaiian Electric's thrift bank subsidiary, American Savings Bank (ASBH). Federal banking laws restrict commercial businesses from owning banks, however Hawaiian Electric's ownership of American Savings Bank had been grandfathered in leading to an odd pairing of an electric utility and a sleepy saving bank. But with the merger, the grandfathered status goes away and HE/NEE is forced to spinoff the bank to shareholders as a condition of the merger. Hawaii is a lovely place to visit, but it's an odd place to do business, especially as a government regulated utility serving the state. Many residents in Hawaii are extremely protective of their unique culture, history, and way of life - politically its a hard sell to have a mainland utility come in and takeover the largest publicly traded Hawaiian company. They also view the utility as a communal company and not a for-profit corporation which needs to serve the best interest of their shareholders. The governor is publicly opposing the merger, there are many websites devoted to blocking the merger, and yet, they also want to free themselves of fossil fuels and generate more of their power within the state. So what's likely to happen is each interest group is going to extract a promise or two out of NextEra, to not lay people off, to keep electricity prices low, to invest a certain amount of dollars into clean energy infrastructure, etc. Eventually this deal gets done, it's just a matter of when. The last and biggest hurdle is getting approval from the Public Utilities Commission in Hawaii, they're currently conducting hearings through December 26th and have committed to a ruling by June 2016, but it could come sooner. In Hawaii there are four banks that control the market and none of them are branded as the big money center banks that you would typically see in other US markets, this goes back to Hawaiian's maintaining their unique culture. The two largest are Bank of Hawaii (BOH) and First Hawaiian Bank which is owned by Bank of the West which is then owned by BNP, a distant but still meaningful third and fourth place are split between American Savings Bank and Central Pacific Financial (CPF), which is also publicly traded. Hawaii is a pretty attractive banking market, it's seen healthy mid-single digit growth in both loans and deposits in recent years in an otherwise growth strained national banking backdrop. The real estate market is strong, relatively constrained by their island geography and having much of the land zoned as national parks, most of the building is up not out (see HHC's Ward Village). The economy is driven by two main sectors, federal defense spending and tourism, both of which were reasonably resilient during the 2008-2009 financial crisis. Plus, I like the added benefit of being remote and a closed off market for other players, it's unlikely that the four banks in Hawaii would see a new competitor come in and start a pricing war. 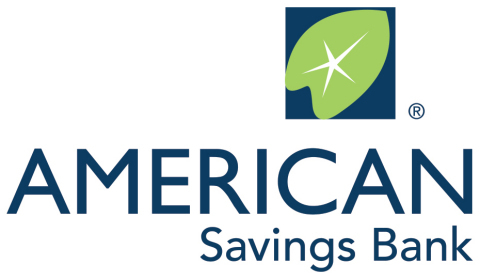 American Savings Bank specifically is run as a fairly conservative thrift bank, it holds a considerable amount of residential loans (Hawaiian mortgages typically fall under the jumbo category) and its funded exclusively with low cost deposits. ASBH feels like a combination of a spinoff with elements of a mutual bank conversion. As part of Hawaiian Electric, American Savings Bank distributed income up to the holding company in order to support the dividend in lean years, as a standalone company they'll have individual discretion on their capital allocation without the outside of interests of a cash strapped electric utility. There's also an interesting regulatory upside as a result of the spinoff, in 2010 as part of the Dodd-Frank legislation, the Durbin Amendment limited fees charged to retailers for debit card processing. It contained a waiver for banks below a certain asset threshold, as apart of Hawaiian Electric the bank had it's fees capped, but as a smaller standalone entity, American Savings Bank will no longer fall under the restriction leading to an additional ~$6MM in revenue (mostly falling straight to the bottom line). Management is likely to become more aggressive as a result of the spin, compensation will be easier tied to the bank's performance and they plan to branch out into more profitable lines of business. As I'm writing this, NEE trades for $100.03 and HE trades for $28.60, doing some algebra and (of course assuming the deal gets approved) one could synthetically create ASBH for $3.96 per share of HE or $11.89 assuming the 3 shares of HE for 1 share of ASBH ratio. That equates to a market cap of $426MM for a bank with a tangible book value of $557MM. As mentioned above, ASBH has two easy public comparables in BOH and CPF that do substantially all of their business in Hawaii. Bank of Hawaii is a serial share repurchaser, when you buyback shares above BV it reduces the BV per share even if it's otherwise accretive so it appears BOH is trading for a rather absurd BV multiple. Central Pacific Financial is probably a better comp anyway, they're roughly the same size and have similar performance metrics, if ASBH were to trade for the same P/TBV multiple it would be worth $7.50 per HE share, or almost twice as much as it's being valued today (admittedly much of the discount is the merger arb spread). If you took CPF's P/E ratio and applied it to ASBH, you'd get $8.69 per HE share. At the time of the deal, HE and NEE pegged the value of ASBH at $8, so somewhere in that range seems reasonable. The problem for me at least is how to structure the trade/investment? One could short 0.2413 shares of NEE for each share of HE, but the capital required to create a meaningful position synthetically in ASBH is somewhat prohibitive. One could also wait until after the spinoff, there are likely to be many forced sellers (utility focused funds/ETFs) and other retail investors that might indiscriminately sell a small unwanted bank position. But I'm a little impatient, and have established a medium sized long position in HE (unhedged), with hopes of picking up some of the spread when the deal gets approved and then buying more of ASBH post spin if it's still cheap. MMA Capital Management (MMAC) is essentially a pile of assets (mostly tax advantaged low income housing bonds) selling well below their true net asset value. In 2015, the company has been recognizing large gains by selling off low basis real estate acquired during the financial crisis via foreclosure and then starting up a solar energy lending business with a JV partner where they'll ultimately park $50MM dollars while also earning a management fee. Cost accounting, consolidation rules, and it's inability to recognize the sale of the LIHTC business for GAAP purposes has artificially reduced the reported book value of the company. MMA Capital released their Q3 results on Friday (11/13), they're hosting a call on Thursday (11/19) so if there's anything new that comes out of that I'll update this post as well. The company's reported book value is up to $15.55/share, this time last year it was $9.25/share, the increase is mostly a result of monetizing low basis real estate, but if you take the time to read the 10-Q (not an easy read), there are two additional items that happened after 9/30 that increase their book value even higher making the current share price a bargain even after an impressive run this year. On October 30, 2015, the Company's investment in preferred stock were fully redeemed by the issuer at par value of $36.6 million and, as a result, the Company terminated the two aforementioned total return swaps and will recognize a gain of $5.2 million during the fourth quarter of 2015. Refer to Note 6, "Debt", for more information. Now $5.2MM might not seem like a lot, but on an $89MM market cap it's pretty significant, it's an additional $0.79/share in book value and also reduces the company's debt, and confusing TRS arrangements. On November 12, 2015, the Company reached an agreement to acquire at a significant discount from the bankruptcy estate of one of the co-founders of IHS, all interests held by such estate in the Company's subsidiaries or affiliates, including notes payable and other debt obligations of the Company that had a carrying value in the Consolidated Balance Sheets of approximately $4.4 million as of September 30, 2015. Among other provisions, such purchase agreement provides for the release and discharge of the company from its payment obligations associated with such deb instruments. As a result, and based on all consideration to be exchanged under the agreement, the Company will recognize during the fourth quarter of 2015 a net gain in its Consolidated Statements of Operations that is estimated to be between $3.0 million and $3.5 million. Let's call it $3MM on the low side, or another $0.45 per share in book value. So without anything additional, and assuming no big market disruptions/losses, we know the year book value will be at least $16.79 per share. It's trading at $13.79 or 82% of that adjusted/current book value. $418.2MM in NOLs, at a 35% tax rate that could be worth ~$145MM, more than the entire company. It's hard to imagine them utilizing in current form, but on previous conference calls they've emphasized their understanding of its potential value and back in May adopted a Rights Plan to reduce the change of control risk. In 2014, they sold their LIHTC asset management business to Morrison Grove Management, but retained the yield guarantee and included an option to purchase Morrison Grove starting in 2019. They provided seller financing to Morrison Grove, the balance of which is now $13 million, but that's off balance sheet (I forget the reason, either the yield guarantee or the option to buy). The option to buy the company in 2019 could be valuable in itself and another operating business to generate taxable income. The carrying amount of their remaining real estate is $25.1 million, they estimate it to be worth $29.2 million, it could be worth more as they've put some of their real estate into JV's with developers who are re-purposing the assets and hopefully generating more value. The MGM seller financing and the real estate at fair value would add another $2.61/share to the BV above the two post quarter adjustments we made earlier for an all-in value of $19.40/share. The same management that created all this mess is still in place, MMA Capital seems to be the one example of management knowing where all the bodies were buried and actually being able to extract significant value out for shareholders. There's still a lot to be done, the ongoing businesses are basically break even, they still need to develop a sustainable business plan to move from being valued as an NAV pile to more of an operating business. The new MMA Energy Capital business might be a step in that direction. Green Brick Partners (GRBK) is a former NOL shell (BIOF) which David Einhorn engineered an interesting reverse merger in 2014 with a home-building operation founded by Jim Brickman. David Einhorn came to know Jim Brickman on the old Yahoo message boards discussing Allied Capital, Brickman's analysis helped fuel Einhorn's short crusade against the company and afterwards they became close friends/partners. Einhorn is now the Chairman of Board and Brickman is the CEO of Green Brick. The company has an $83MM deferred asset as a result of the old BioFuel Energy net operating losses, meaning it won't pay income taxes for the next several years. The low float (Greenlight owns 49%, Third Point 16.5%), initial rights offering, secondary raise, and other events have led to a lot of stock price volatility. On 7/1/15, the company completed a secondary offering of 17.45 million shares at a price of $10.00, with Greenlight and Third Point fully participating in the offering to maintain their ownership percentages (important to keep the NOLs in place), the cash raised fully paid off the expensive 10% term loan the company had in place with Greenlight when it completed the reverse merger with the old BioFuel Energy. On October 30th, Green Brick Partners fired their COO and took down their 2015 pre-tax income guidance from the $29-32MM range to $22-24MM, since then about $210MM in market cap (stock price was as high as $14.94 this summer, now $6.60) has been sliced off the company leaving the shares trading at a discount to book value (which includes the DTA). The Q3 conference call held on 11/13 didn't provide much reassurance as the company admitted to misjudging their customers in Atlanta and building too high-specification homes that just weren't selling (fixable). Combined that with their labor shortage issues in their Dallas communities (fixable) and the stock market has harshly penalized management who made the mistake of just reaffirming their original guidance in a mid-September investor presentation. Where does that leave us now? Homes aren't a fad product like say a GoPro camera or a FitBit wearable device where a guide down in the later half of the year could signal much larger demand problems. 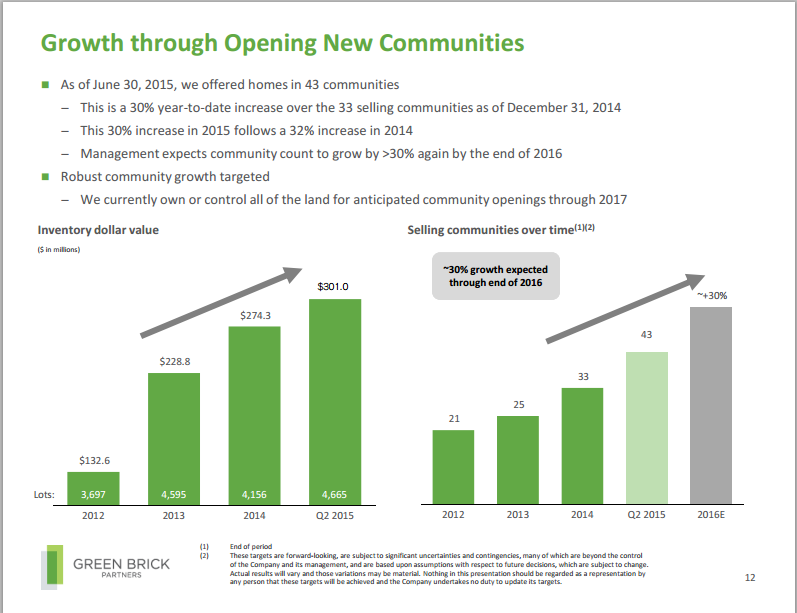 We knew that Green Brick's revenue was going to be back loaded this year with the opening of two large communities (Twin Creek in Dallas and Bellmoore Park in Atlanta) happening in the fall. While it's disappointing that both of these developments are facing issues at the same time, I get the sense that the revenue will simply get pushed back into 2016 and the current washout is a buying opportunity. Both Dallas and Atlanta are high demand, growing, sun belt markets, and the housing market seems to have finally burned off most of the excess supply built leading up to the financial crisis. With their unlevered balanced sheet, Green Brick should be in a position to additionally make acquisitions, there was a hint of that in the Q3 press release below, but I didn't catch any further commentary during the conference call. Net income figures below are projections pulled from Bloomberg and then Green Brick's own lower guidance, if I'm right about profits being pushed out to 2016 the shares look very cheap at just 13.5x 2015 pre-tax earnings, 90% of book value, and essentially a clean balance sheet. I listened to people smarter than me and sold down some of my position around $12, but still held quite a bit through this slide and today bought back in at $7.00 most of what I sold. Green Brick is of course partially a jockey play on David Einhorn (who is having a self admitted terrible year) and Jim Brickman, both remain impressive to me, and the structure of the company keeps them involved and encourages them to create long term shareholder value. I wouldn't lose faith in either just yet off of a $~8MM drop in near-term guidance.